LinkedIn, the largest and most popular business-oriented social networking service, announced over the weekend their top 25 “hottest skills” of 2014. What is a “hot skill” you’re likely wondering, as I did. Basically, LinkedIn looked across all 330 million member profiles, determined who was hired, which jobs were posted that recruiters were searching for talented individuals to fill and what skills were critical for those positions. 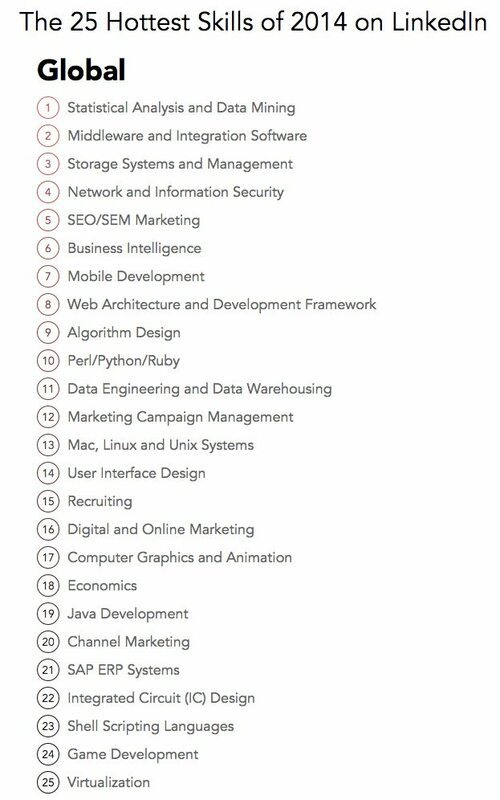 I guess you could say that LinkedIn did some data mining and statistical analysis to find the top 25, so it’s of little surprise that “Statistical Analysis and Data Mining” was listed as the top skill of those individuals in highest demand. Statistical analysis and data mining (and data collection and integrity) are the same skills that Six Sigma Green Belts, Black Belts and Master Black Belts are taught and required to have command of. Below is the full top 25 global list, compliments of Linkedin. Read the full article on LinkedIn, including a breakdown of top 25 list by country.